Months of harassment culminate in deprivation of congregation’s ministry property. JUBA, South Sudan (Morning Star News) – The Sudanese government today helped Muslim investors take over the remaining property of Khartoum Bahri Evangelical Church in Khartoum North, church leaders said. Riot police on two trucks arrived at the church property at noon and assisted in the seizure of the land by force. “Over the past year they have aided another Muslim businessman to seize a piece of the land, and today they are taking the only piece of land left for the church,” a church leader who requested anonymity told Morning Star News. The take-over comes less than a month after the government seized another Christian facility in Khartoum. The church is appealing to Christians worldwide to pray for them. 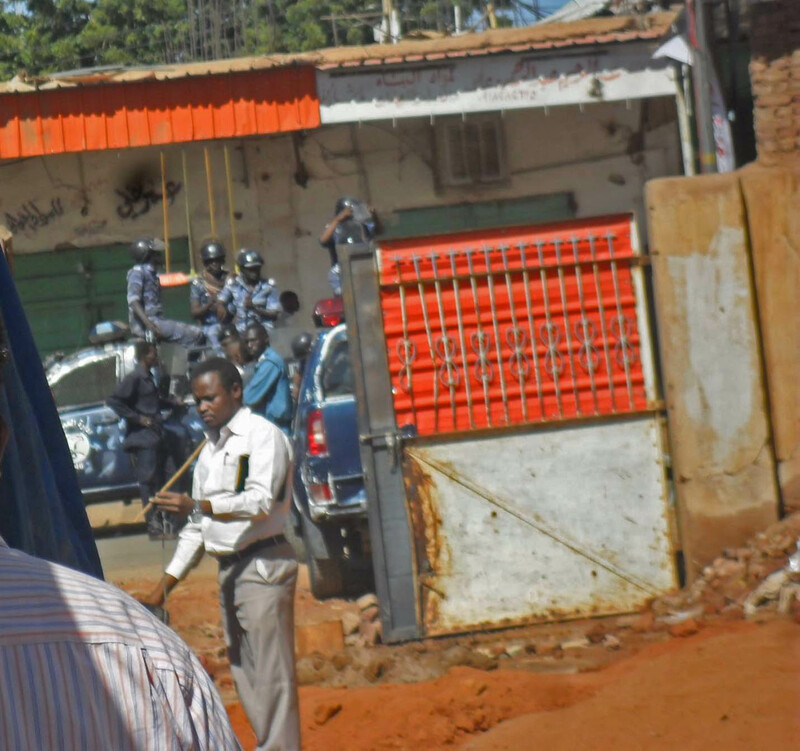 On Oct. 5, 2013, Sudan’s police and security forces broke through the church fence and beat and arrested Christians in the compound, asserting parts of the property belonged to a Muslim investor accompanying them. As Muslims nearby shouted, “Allahu Akbar [God is greater],” plainclothes police and personnel from the National Intelligence and Security Services (NISS) broke onto the property aboard a truck and two Land Cruisers. After beating several Christians who were in the compound, they arrested some of them; they were all released later that day. On Dec. 2 police beat, arrested and fined 38 Christians worshipping at the church. After nearly two weeks of raiding and demolishing church property, officers armed with guns and batons arrived at the church compound at 6:30 a.m. on two trucks accompanied by seven smaller vehicles and broke through the main gate, beating whoever they found in the church complex, sources said. Security personnel surrounded the complex, preventing people from entering or leaving, they said. Police then started to beat worshippers and arrested 38 for refusing to surrender the property, eyewitnesses said. Severely beaten was church elder Daud Bashir. Officers also beat a female member who was rushed to hospital for treatment, sources said. Leaders of the Sudan Presbyterian Evangelical Church (SPEC)-affiliated congregation said charges against them included Article 77 of the notorious Public Order Law of 1991, which gives police broad powers to arrest Christians and other lowly regarded people without cause, for creating a public disturbance. The Christians were released that night, with many of them being sentenced to pay a fine of $250, sources said. Five church leaders arrested on Nov. 25 were released that same night and were not on the premises in the Dec. 2 raid. With Muslim investors laying claim to the land based on an agreement signed by a government-installed church committee that church leaders say did not legally represent the church, a bulldozer accompanied by security personnel and police knocked down a wall of the church and houses on Nov. 17-18. Christians formed a human barrier to face down further demolition attempts on Nov. 19-20. Church members regard the committee that arranged the transfer of the property to business interests as a “government puppet committee” supporting the government agenda to do away with Christianity. In November authorities destroyed the home of pastor Hafiz Fasaha at the SPEC church compound after ordering personnel inside to leave the premises, church leaders said. Authorities told the Christians a Muslim businessman owned the land and that they had a court order calling for the use of force to take over the property. While the church blames the government for the court order that it surrender the property, a representative of the Muslim businessmen laying claim to it has said a contract was signed about four years ago giving them the right to invest in the land for a period of up to 20 years. The representative asserts that because of church opposition he had to go to the government to take the land by force. Church leaders hold ownership papers to the property and believe any contract surrendering it comes from a government ruse. Harassment, arrests and persecution of Christians have intensified since the secession of South Sudan in 2011, when President Omar al-Bashir vowed to adopt a stricter version of sharia (Islamic law) and recognize only Islamic culture and the Arabic language. Meantime, two pastors of South Sudanese descent remain arrested without charges in Khartoum, sources said. NISS personnel arrested the Rev. Peter Yein Reith of the South Sudan Presbyterian Evangelical Church on Jan. 9 as he returned to his home at the Gerif West Bible School in Khartoum from a prayer meeting, said a source who spoke on condition of anonymity. Reith received a phone call earlier that day from someone threatening to “arrest” his wife and 1-year-old son if he failed to go to his home immediately. Though of South Sudanese descent, Reith has always lived in Khartoum. On Dec. 14, NISS officials arrested a visiting South Sudanese pastor from Juba, the Rev. Yat Michael, after Sunday worship at Khartoum Bahri Evangelical Church. He is still in custody. Brethren my prayer is with you & the Living God himself will come to your rescue for His Glory. I Love you all! I suggest that they ask you for mercy, because we are getting close to the last days, I believe….